Power BI is revolutionizing the BI industry with its open platform to visualize any data, in any way, from anywhere. When it comes to Data Connectivity, it already has extremely rich and diverse set of native connectors and is growing very fast with new connectors and partners with every update. Just this month, 6 new connectors have been added and we now have 45 native connectors for Files, Relational databases, Data warehouses, Line of Business Applications, SaaS providers, OLAP systems, Cloud storage systems, Web sources, Social networks and Big data. In addition to native connectors, you can also use generic ODBC connector or the OData feed to connect. This November update is significant for Power BI Desktop connectivity with four major advancements. OLAP came into prominence because it provided fast access to aggregate information over large volume of data. SQL Server Analysis services brought this to the masses and started the inroad to democratizing BI with the introduction of Multi-Dimensional model a decade ago. SSAS is the most widely adopted OLAP system in the planet and has been the workhorse for many organizations. Since the launch of Power BI, SSAS MD connectivity has been in the very top of user’s wish list. We will roll out more capabilities in the subsequent updates such as hierarchies, display folders, ability to publish reports to the Power BI service and connecting live to On-Premise SSAS Multidimensional models, etc. 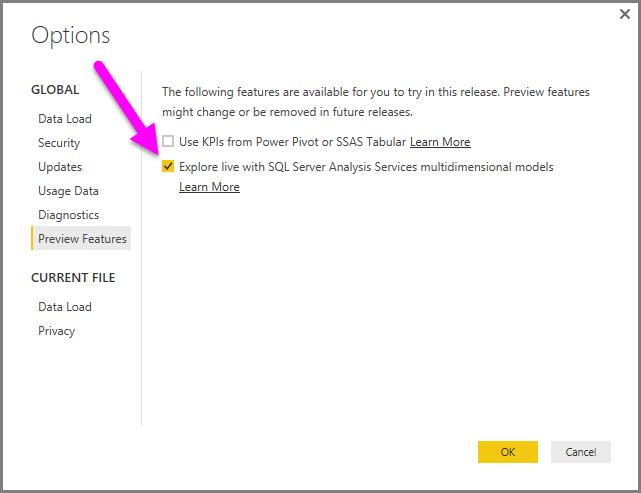 To enable this feature in Power BI Desktop, select File > Options and settings > Options, then under GLOBAL, select Preview Features and enable the checkbox as shown in the following image. SAP is a key Enterprise BI data source and Power BI connectivity to SAP is a sought after feature from Enterprise customers to unlock insights from heavy investments they have made already. This November update signifies the beginnings of our investment in this area. You can now connect to SAP HANA either in DirectQuery or import mode, consume the BI artifacts very easily through our specialized Hana connector with optimized navigation for information models. You can also use direct sql capability to connect to raw tables, if you chose to do so. This is available as preview in November update of Power BI Desktop. In the subsequent updates, we will enable the capability to upload this report to Power BI Service and connect to your On-Premise SAP HANA server. Also in the coming months, expect to see more connectivity options from Power BI to SAP such BW and ECC. Stay tuned for further announcement in this area. ‘R’ has become synonymous to advanced analytics and the de facto programing language for data scientists and business analysts alike. Power BI, being the open and flexible BI Tool, brings ‘R’ close to the masses with the new native ‘R’ script connector (Beta) in this update. Users can now provide an R script to execute on a local R installation and import the resulting data frames into Power BI Desktop. R has a thriving strong user community and thousands of ready to use packages. With its extensibility model, the integration possibilities are limitless. You will continue to see enhancements and new capabilities in Power BI leveraging ‘R’ going forward. Sometime you will want to work with the data source without importing the data. It could be due to many reasons, for ex, your desire to get most up-to-date data or leverage the investments made in the source system or data is simply too big to move. But, at other times, you may also want to import the data into Power BI to do cleanup, mashup or to have instant offline access. In Power BI, we strive to provide the option to you and let you choose how you want to connect. 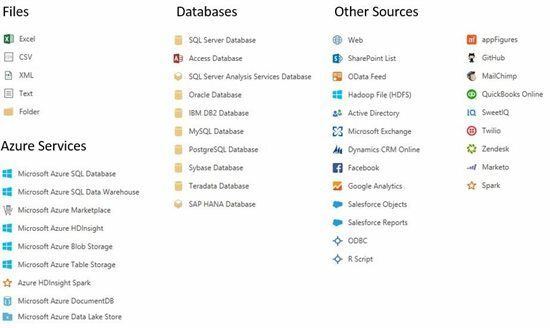 DirectQuery for SQL Server and Azure SQL Database debuted as preview feature last month and since then they have graduated to become regular features in Power BI Desktop in this release along with DirectQuery support for Azure SQL DW. We are aggressively expanding our data connector portfolio enabling DirectQuery mode and you will be hearing many more announcements on this topic in the coming months. Oracle, Teradata and Spark are at the top of this list. We also have Azure Data Lake, UserVoice and Marketo connectors in this release. We are committed to expand the depth of connectivity options and the breadth of native connectors in Power BI with its openness to connect to any data and allow you to visualize in any way, and access it from anywhere. Check out the November update , explore the data connectors available in Power BI and share your feedback with us through In-product feedback options (Send a Smile/Frown, Rate your experience) or through community forums / user voice.